Miller, James R.. "Indigenous-British Relations Pre-Confederation". The Canadian Encyclopedia, 26 October 2018, Historica Canada. https://www.thecanadianencyclopedia.ca/en/article/aboriginal-european-relations. Accessed 24 April 2019. With the end of the Seven Years’ War in 1763, Britain replaced France as the preeminent colonial power in the land that is now Canada. In doing so they assumed the legacy of Indigenous-French relations. Relations under British rule continued for some decades along the lines established during the French era. From the Great Lakes eastward, commercial and military interactions dominated the interchanges between Indigenous and immigrant peoples. In the 19th century these links would be replaced by a different form of association — policies that advocated assimilation, subjugation and even destruction — as European settlement pushed westward. Crowfoot (centre) with his family in 1884 (courtesy Glenbow Archives/NA-1480-31). Martin Frobisher's men repell an attack by Inuit in a painting by John Whyte (courtesy British Museum). In eastern Canada, British strategic considerations meant that Indigenous nations remained desirable as allies from the American Revolution to the 1820s. Throughout this period the British tried to maintain alliances with interior nations, while most Indigenous peoples found alliance with the British more attractive than either neutrality or support for the Americans. The reasons for this support can be seen most clearly in the brief career of the Odawa chief Pontiac, who forged a common front of First Nations of the southern interior after the Seven Years' War. Pontiac's forces sought to resist the expansion of Anglo-American agricultural settlement from the seaboard colonies. This strategy remained popular among many Indigenous groups, including the Shawnee leaders Tecumseh and his brother Tenskwatawah (also known as The Prophet) who supported the British during the early stages of the War of 1812. Tecumseh and Tenskwatawah’s aim was to establish a self-governing Indigenous state west of European settlement.To defend these lands from American expansion, they chose an alliance with the British, who made promises to support an autonomous Confederacy of Indigenous nations. After the War of 1812, however, these agreements became much less advantageous to the British, who abandoned their promises, allowing virtually unchecked westward American expansion. A lasting consequence of the age of alliance was the Royal Proclamation of 1763. Issued by the imperial government to delineate the boundaries and stipulate the governance of its new colony, Québec, the Proclamation also attempted to control increasing tensions in the interior of the continent. The Royal Proclamation forbade European settlement and regulated trade west of European colonies, and recognized these interior lands as Indigenous "hunting grounds." Under the Proclamation only the Crown could accept surrenders for such lands. This requirement laid the basis for the system of land-surrender treaties that was pioneered in Ontario in the late 18th and 19th centuries, and was replicated on the prairies after Confederation and in the north in the 20th century.The Proclamation did not, however, cover eastern settlements, where Mi’kmaq, Maliseet, Passamaquoddy, Innu, Wendat, Algonquin, Haudenosaunee and other peoples interacted with imperial administrations through other agreements, or were subject to encroachment and marginalization. The British inherited from the French a commercial partnership with Indigenous peoples, which moved westward and northward after the 1760s. In the lands granted to the Hudson's Bay Company (HBC) in 1670, an influential new type of relationship developed after the HBC began to move inland and establish posts from the 1770s onward. The HBC and the Montréal-based North West Company, who amalgamated under the name of the former in 1821, traded with the Cree, Assiniboine, Saulteaux and others in the western interior, although epidemic disease, combined withthe abuse of alcohol and violence, led to severe losses to population and culture. A vitally important social consequence of the western trade was the emergence of the Métis, the offspring ofunions between European traders and First Nations women on the Plains. Two subdivisions were present: the country-born were offspring of English or Scottish traders and First Nations women, while the Métis were the result of marriages of francophones and Indigenous women. These mixed-blood communities found their centre of gravity near present-day Winnipeg, where they lived harmoniously with Indigenous people and Europeans. As HBC's trade increasingly emphasized the northwestern Athabasca District after 1821, and various smaller posts were shut down in the wake of HBC’s amalgamation with the North West Company, many Métis previously employed in the fur trade shifted into the provisioning trade that supplied pemmican, a food product of the buffalo hunt, to distant posts. Though Métis found success in producing pemmican, the industry was not without its problems. The 1814 Pemmican Proclamation, for instance, led to violence between Métis and the colonial administration at the Seven Oaks in 1816. Toward the end of the 19th century marked the beginning of serious decline in the buffalo herds on which the Plains economy was built. Further west, on the Northwest Coast, the HBC also eventually emerged as the dominant partner in the fur trade following its merger with NWC. Beginning in the 1770s with Spanish arrival and accelerating after voyages by British mariners, the Pacific became the site of a vigorous trade in furs, especially sea otter pelts. As in more easterly regions, Northwest Coast groups like the Nuu-Chah-Nulth of Vancouver Island emerged as intermediaries between other First Nations and Europeans and Americans. Even after a land-based trade replaced maritime commerce in the early 19th century, the familiar pattern of economic partnership that had typified the early stages of fur commerce in more easterly areas was replicated in British Columbia. The final Indigenous community to come into extended contact with European newcomers was the Inuit, dwelling north of the treeline in the Arctic regions of Canada. While Viking explorers made small forays into the eastern Canadian Arctic as early as 1000 CE, and explorers — like John Davis in the 1570s — seeking the Northwest Passage contacted the Inuit as well, prolonged exposure to Europeans began in the 19th-century whaling trade. By the middle of the 20th century most Inuit had become integrated into the federal government's administrative services, with varying results. Beginning as early as the 1770s in Maritime Canada, the arrival of increasing numbers of Europeans whose purpose in the New World was farming or mining dramatically altered the nature of relations with Indigenous populations. Whereas the fur trade, military alliance and even evangelism had required co-operation between Indigenous people and newcomers, the shift to farming and mining made them competitors in the eyes of settlers. First Nations people, especially the majority who lived by hunting-gathering, were viewed as obstacles to European economic objectives; extensive Indigenous use of arable lands was seen as a barrier to economic development. The consequence of this change was a shift by the newcomers to policies that aimed at the dispossession and removal of the First Nations from the territories the strangers coveted. In practice these new Euro-Canadian imperatives translated as land-surrender treaties and policies of attempted assimilation and control. Treaty-making, founded on the Royal Proclamation and other agreements, and developed in Upper Canada in the first half of the 19th century, had its fullest application in the western interior after Confederation. 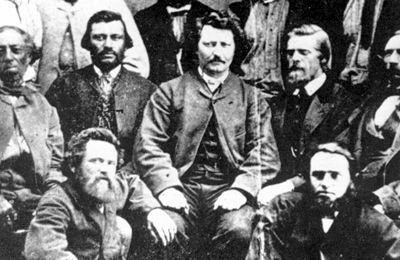 Between 1871 and 1877 Canada negotiated seven agreements, the "numbered treaties," covering a region from the Lake of the Woods to the Rocky Mountains, and from the international border to a line halfway up the prairie provinces. Although not all Indigenous groups wanted to negotiate treaties, a majority of them, particularly the Plains nations, saw treaties as a less repugnant alternative to war and starvation. What pushed most western groups to make treaty was the awareness that the buffalo on whom they depended were rapidly dwindling in number while the population of settlers and farmers was increasing. 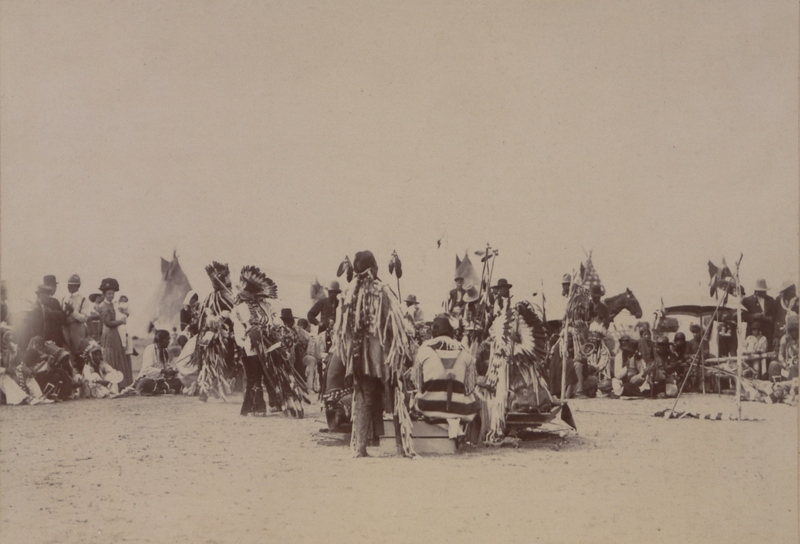 Western chiefs saw treaties as means of establishing a formal link with the newcomers through the Crown, a relationship from which they could draw assistance in an era of transition. These objectives explain why it was chiefs and First Nations negotiators, not government representatives, who insisted that the numbered treaties provide farming implements and schooling. The transition from military and commercial alliances to struggles for autonomy and self-determination was difficult for many Indigenous communities. Though many of the treaties of the late 19th century appeared to prepare communities for transition, in practice, the relations between Indigenous people and the state post-Confederation were far more complicated and destructive. See Indigenous People: Government Policy. Olive P. Dickason, Canada's First Nations: A History of Founding Peoples From Earliest Times (1992); J.R. Miller, Skyscrapers Hide the Heavens: A History of Indian-White Relations in Canada (1989, rev 1991); E. Palmer Patterson, The Canadian Indian: A History Since 1500 (1972). Assembly of First NationsThe website for the Assembly of First Nations. Click on AFN at the top of the page for links to Provincial and Territorial Organizations. Peuples et collectivités autochtonesRessources en ligne approfondies sur les communautés autochtones du Canada, y compris les Premières nations, les Métis et les Inuits. Du ministère des Affaires autochtones et Développement du Nord Canada. Indian Affairs Annual Reports, 1864-1990Browse or search for the complete text of Indian Affairs Annual Reports from 1864 to 1990. Offers data and fascinating discussions of important issues that relate to present day matters of concern to Canada’s Aboriginal communities. From Library and Archives Canada. Rapports annuels des Affaires indiennes 1864-1990Parcourez ou recherchez le texte complet des Affaires indiennes rapports annuels de 1864 à 1990. Fournit des données et des discussions fascinantes de questions importantes qui se rapportent à présenter les choses d'une journée de préoccupation pour les communautés autochtones du Canada. De Bibliothèque et Archives Canada. Aboriginal Peoples and CommunitiesExtensive online resources about Canada’s Aboriginal communities including First Nations, Métis, and the Inuit. From Aboriginal Affairs and Northern Development Canada. Assemblée des Premières NationsSite Web de l’Assemblée des Premières Nations. Cliquez sur l'APN en haut de la page pour des liens vers des organismes provinciaux et territoriaux.